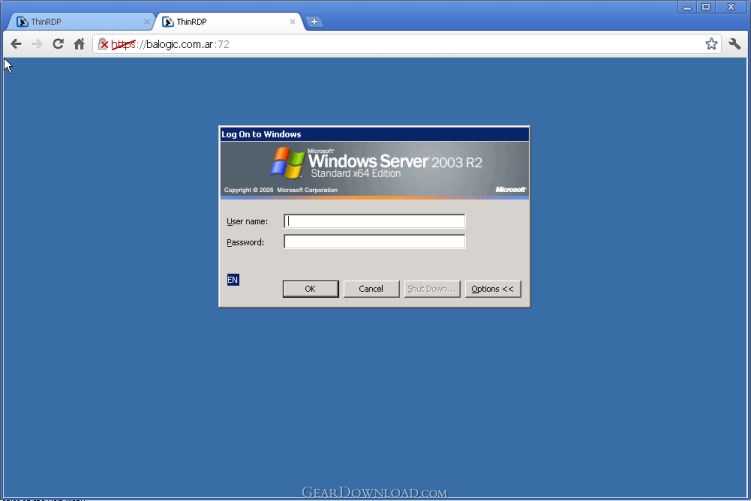 ThinRDP Server - HTML5 Remote Desktop Access Client (RDP). VDI / RDS Access. Audio support. With ThinRDP, users can access all of their Windows programs, documents, files, and network resources through their preferred device PC, iPhone, iPad, Android tablet, ChromeBook, using an HTML5 capable browser. ThinRDP enables secure access to any PC on the corporate LAN through a single, public IP address. This includes access to applications and desktops running Microsoft RDS/ Terminal Services and RDS/VDI platforms, such as session-based applications and virtual desktops. ThinRDP facilitates the complete spectrum of cross-browser, cross-platform access. With ThinRDP, users of Windows, Mac OS X, Linux, Android, and iOS can connect remotely into their Windows desktops through their favorite browser. ThinRDP supports Internet Explorer 9, Firefox, Chrome, Safari, and all other HTML5-capable Web browsers. - Support for PC, iPad, iPhone, iPod Touch, Chromebook, etc. This download (ThinRDPTSSetup.exe) was tested thoroughly and was found 100% clean. Click "Report Spyware" link on the top if you found this software contains any form of malware, including but not limited to: spyware, viruses, trojans and backdoors. ThinVNC, pure web RD client (HTML5 based) 3.0.0.9 - Free Web Remote Desktop Client and Screen Sharing. Thinfinity Remote Desktop Workstation 3.0.0.21 - Free web-based Remote Desktop Access Client (RDP). Help Desk for IIS 2.2 - Web-based help desk software solution for delivering customer support. FAQ Organizer Deluxe 4.2 - FAQ management software for Windows. Business Messenger 1.4.0 - Send notifications directly to the users' desktop (from RSS, SharePoint, etc.)! LiveChat 2.8.3.0 - LiveChat is an easy-to-use live chat software for online sales and support. Polar Help Desk 5.0 - Web based help desk that tracks incidents, integrates with e-mail and more. Polar Help Desk Free 4.1 - Web based help desk that tracks incidents, integrates with e-mail and more.